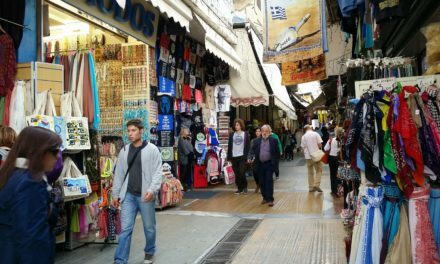 The truth is that there are unscrupulous taxi drivers, but that the vast majority of drivers tourists will encounter are drivers who make their living working with tourists and travelers and derive no benefit from perpetuating the bad rep that Greek taxi drivers have gotten over the years. So how much should you expect to pay for a taxi transfer? The answer depends on where you are coming from and where you are going, the time of day (or night) you are traveling by taxi, and where you found your taxi. 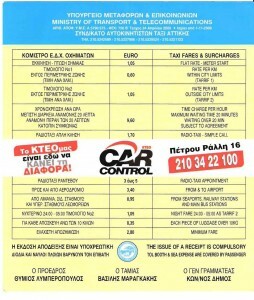 UPDATE (beginning January 2011) : Beginning in 2011 there has been a fare increase resulting from the VAT increase in Greece. 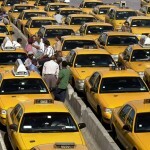 Taxi rates in Athens are now 13% higher than they were in March 2010. Anytime a passenger is in the taxi (according to one driver “even when my wife is in the taxi with me!”) the meter must be running. This means that even when you have prearranged a transfer, with a pre-agreed price, the meter is running once your taxi transfer begins. In the case of a pre-arranged pick-up at the port or airport, this means the meter starts running when the driver arrives at the port or the airport – even while they are waiting for you in the Arrivals Hall or at the end of the ferry or ship’s ramp, their meter is clicking away inside their taxi. And, if you’ve prearranged to pay a set rate, perhaps 45 or 50 or even 55 euro from the airport, you may discover that you’ve gotten yourself a deal over paying what the meter says; or at least you can console yourself by realizing that you had a trouble free, hassle free and wait free arrival and pickup which you actually paid very little for, given the service you received. 6. Radio taxis (calling in for a taxi right now) has a surcharge of 1.70 euro. 8. Waiting time: Charged at 9.60/hour for up to 20 minutes …. Anything beyond 20 minutes, the hourly rate can be negotiated between the driver and the passenger. 39.55 euro, fare clicked per km (based on above 33 km) without an appointment – wait in line, get the cab you get. When pre-arranging a pickup that requires a wait of more than 20 minutes, the driver and the passenger may come to their own agreement regarding the cost of the transfer and the amount charged for waiting time. Thus, when you contact a transfer service and they tell you a set fee for an airport or port transfer, or for a day trip, they are building in a PRE-SET rate based on the fact that they will be waiting for you for more than 20 minutes during the period of time that you have reserved them for. 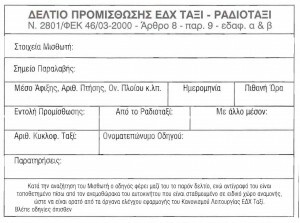 This is legal and stated clearly on the rate cards posted in all legally operating, licensed taxis in Greece. Taxis are also required to issue a receipt if one is requested, which might be the same as the following standard order form all drivers must have with them when arriving for a pickup. When you book a pre-arranged transfer, pickup or day trip (to or from the airport or port or a day trip) your driver will arrive with one of these forms completed. It will include your name, the number in your party, where you are being picked up, how you are arriving (boat, plane, etc) and the possible time of arrival. It will also include the order number and how the order or request was placed (from a Radio Taxi dispatcher, from a travel agent or hotel or directly), along with the taxi driver’s license number and any other important notes regarding the pickup. While the driver is attempting to locate the Passenger, [the driver] shall carry with him/her this page; a copy of this page shall be placed at the windshield of the car that is parked in the special waiting area. [this copy shall be placed] in a conspicuous location so it can be seen by the Taxi regulations enforcement authorities. It’s this “order form” or “taxi pickup request” which permits the driver to leave his car parked outside the airport, and which authorities can request the driver produce at any time while they are in the airport (or port) area or departing the airport or port area with passengers. Being caught without this form can result in serious, income impacting pentalities for the driver.